Genre: Various. Ranges from traditional to metal to lounge. Seriously. Target Audience: This is perhaps the most universal collection of pirate music ever. If you love any aspect of the genre, these albums are for you. It’s a big question, and the answer may wildly vary depending on who’s asking. Someone with a background in sea shanties would likely enjoy the traditional styled pirate music of Marooned or Bounding Main, while someone with more contemporary tastes might prefer Pirate-Core, as could be found with Pirates R Us or the Jolly Garogers. Of course, both options sound deceptively brief, as Pirate-Core and Pirate Traditional alike feature a gargantuan variety of styles and flavors. Traditional can be found somber or quirky, historical or original, piratey or more generalized nautical, and so on. Pirate-Core of course can range from punk to metal to rap, and so very much more. So where to begin? It’s tough to say. 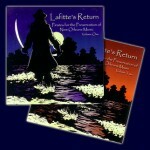 Actually, with the release of Lafitte’s Return Volumes One and Two, maybe it’s not so tough after all. 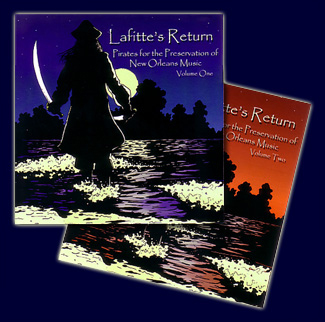 The Laftitte’s Return albums are produced by the Pirates for the Preservation of New Orleans Music (PPNOM) – a non-profit organization dedicated to aiding school music programs in New Orleans in the wake of Hurricane Katrina. It’s a fine cause in itself, but it’s also an excellent charitable focus for music-loving pirate fans. All proceeds from the sales of Lafitte’s Return go directly to PPNOM, which means more kids living in swamp land can learn to hum and play instruments and make pirate music of their very own, and thus the circle of life continues. So now that we’ve addressed the feel-goodery of these albums, let’s address whether they’re actually worth buying, or if it’s just a charitable donation with a CD attached to it – and I’m quite pleased to say that these albums are worth every penny! Between albums 1 and 2 (each sold seperately) we’re talking 41 songs. Some of them would qualify as general sea shanties (Spanish Ladies, Jack Tar, Farewell to Nova Scotia) but the vast, vast majority are distinctly pirate in subject matter. The style ranges all over the place – lovers of traditional pirate tunes will find Skip Henderson, Rusty Cutlass, Skeleton Crew Pirate Band, Salt Sea Pirates, The Pyrates Royale, Rant&Roar, and many others, while fans of Pirate-Core will be treated to Sforzando, Billy Knight, The Pirates Charles, There Be Pirates, Scuurvy, Sunken Chest – and this list too goes on. All told, it’s a delightfully diverse mix of pirate music, with something – many things – to please pirate fans of all tastes. If you’re new to the world of pirate music, Lafitte’s Return can serve as an entry point without equal. If you’re already a seasoned fan of pirate music, you’ll likely find Lafitte’s Return to be a wonderful mix of your old favorites, your new favorites, and – more likely than not – several new discoveries. A must have for all pirate music lovers. This entry was posted in Music and tagged bilgemunky's favorites, contemporary folk, pirate metal, pirate shanties, pirate-core, ppnom, various artists by Bilgemunky. Bookmark the permalink.